Mark Lemmon Sensei began training in the Martial Arts at the age of 10, studying Judo, then Tae Kwon Do followed by Kung-Fu. In September of 1980 Lemmon Sensei began training regularly in Yoshinkan Aikido in the Windsor, Detroit and Ann Arbor areas. 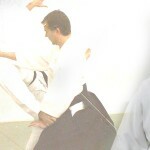 In addition to regular Aikido training, Lemmon Sensei graduated from a 20 month Kenshu course (weapons techniques and philosophy) as well a 10 month instructor’s course (intensive study of techniques and philosophy).Sensei Lemmon was among the first to receive an International Yoshinkan teaching certificate awarded in 1990 personally by Yoshinkan founder Gozo Shioda Sensei. Lemmon Sensei was promoted to Rokudan (6th degree black belt) in April 2008 and in April 2001, he founded the Aikido Seikokan Dojo. 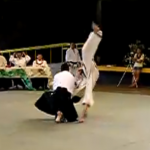 He has over 20 years teaching experience and has arranged and participated in Aikido demonstrations and seminars in England, Canada, U.S.A., and Japan. Lemmon Sensei has a Bachelor of Arts Degree in Psychology as well as a College degree in Business and currently works as a full time Professional Aikido Instructor.